I love immersive theatre. I love to be in the midst of the storytelling. And I love when I can feel passion in the room. Being moved and inspired doesn’t quite describe what I felt on opening night of Soul Doctor. I was totally overcome by the energy and love in the room. The shul turned theatre space is perfect for the return of Shlomo. 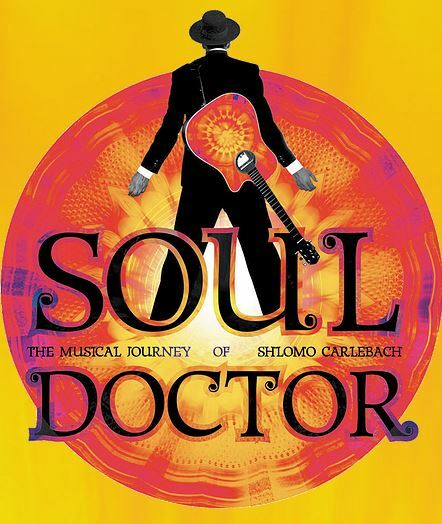 After a brief run last summer on Broadway, Soul Doctor returns under the direction of Mindy Cooper as shorter and tighter at The Actors Temple. All I can say, again, is that I was filled with emotion from the beginning of the show as Shlomo Carlebach (played powerfully by Josh Nelson) and his congregation infused the space with Jewish music and singing. The story of his life begins with him in Vienna soulfully and musically engaging his followers in love, joy and freedom. The prescription for feeling broken. The story then unfolds as we travel back to his life as an 11 year old boy during the Hitler regime. The beautifully crafted songs continue the story of Carlebach’s life through his upbringing and awakening in New York City as the son of a lineage of rabbis, his chance encounter with Nina Simone (played exquisitely by Dan’Yelle Williamson) and his big break as a recording artist which landed him at the Berkeley Folk Festival. Shlomo’s story, supported by his faith, his friendship with Nina and the many lost souls that he touched, is beyond inspiring. David Goldstein kept with the style of The Actors Temple by creating a simple set with wood paneling and stain glass windows. By designing the set in this way, he provides a space for The Holy Beggar Band on top as well as a backdrop for the projections that indicate locale throughout the show. The set also provides this ensemble cast to move seamlessly and effortlessly into the different characters that Carlebach meets along his path. As an extra bonus, the audience was treated with a few songs by Carlebach’s daughter, Neshama Carlebach, after the show ended. She has followed in her father’s footsteps. I had such a good time being wrapped up in the story and the music. What a night! Shlomo Carlebach’s goal was simple: to reach the masses with love and to express freedom through music and his faith. This gentile received the message and passing it along. Directed by Mindy Cooper; Book by Daniel S. Wise;Music and Additional Lyrics by Shlomo Carlebach; Lyrics by David Schecter.